Partial mash beer brewing provides an intermediate step for those experienced with extract brewing, but not yet ready to make the investment to brew all grain beer. This week we take a look at how to do partial mash brewing using equipment already available in the average kitchen. Extract brewers have access to a fairly broad set of ingredients, but there are a number of specialty grains that do require mashing for proper use. 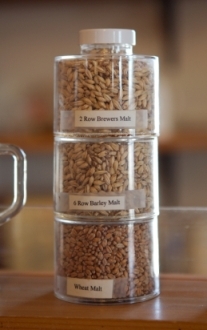 Examples include malted wheat, Munich malt, Vienna malt, flaked barley, and many high protein adjuncts. Brewing many authentic wheat beers, German beers and specialty beers requires one to mash. While many brewers make the direct leap to all grain brewing, partial mash brewing techniques provide a great intermediate step to achieve the benefits of all grain mashing without the investment in large amounts of new equipment. Today we’re going to look at countertop partial mash techniques that minimize the need for extra equipment. Countertop partial mash brewing requires little in the way of new equipment beyond that needed for regular extract brewing. At a minimum, a grain bag is needed to contain the grains. Many partial mash brewers also use a small, clean drink or picnic cooler to hold the temperature of the mash during the mash period. In partial mashing, only a portion of the grains required for an all grain beer are mashed, while the bulk of the wort is made from malt extract. Typically only the specialty grains plus a small amount of pale malt are actually mashed, and then the runnings of the mash are mixed with malt extract and boiled to produce the beer. When formulating a partial mash recipe, you need to have a combination of the specialty malts needed for the beer plus a few pounds of pale malt. The pale malt is needed to provide the critical enzymes needed for mashing, as specialty grains do not normally contain these enzymes. The mashing process converts long, complex sugar molecules into shorter ones that yeast can consume. For mashing, a combination of grains and water must be mixed together and held at a constant temperature range between 148-158 F – ideally around 154 F. The challenge is to maintain a constant temperature for the time it takes the mashing to complete – typically 30-60 minutes. Two methods are typically used to maintain temperature. One is to heat the mash mixture over a stove and attempt to regulate the heat to hold a constant temperature. A second method, called infusion mashing, simply heats a premeasured quantity of water and mixes it with the grains in an insulated container like a small cooler, relying on the insulation of the cooler to maintain a constant temperature. I’ve tried both methods, and I strongly prefer the latter. Maintaining a constant temperature within just a few degrees over a typical stove is very difficult. Further if you overshoot your target temperature by a significant amount you can bring the mashing process to a halt resulting in an incomplete conversion of the sugars. For infusion mashing, place your crushed grains in a grain bag and determine the correct amount and temperature of water to add. Typically 1.2-1.7 quarts of water are added per pound of grain. The temperature of water needed can be calculated using the BeerSmith infusion tool. Preheat the water, add it to your cooler, and then add the grain bag and seal the top to maintain a constant temperature for 30-60 minutes. You can confirm that the mash is complete with a small amount of iodine. Pull a small amount of liquid from the mash, and add a few drops of iodine. If the added iodine turns clear, then the mash is complete. If it is still dark blue, then the mash is not complete. Once complete, simply slowly remove the grain bag from the mash. Add the resulting hot liquid to your boil pot, mix in your malt extract and top it of with water to proceed with the boil, cooling and fermentation just as you would with any normal extract beer. I hope you enjoyed this week’s article on partial mash brewing from the BeerSmith Home Brewing Blog. Subscribe or join us next week for another great beer brewing article. How much is “a few pounds of pale malt”? I would add one or two pounds of pale malt (a pound is just under 1/2 kg). Why do you say to slowly remove the grain bag? To allow all of the wort to run from it without splashing or making a mess. Can an oven be used to hold the temp? I suppose you could use an oven though the temperature control at relatively low mashing temperatures might not be all that accurate. Using the cooler method, what’s the best way to raise the mash temperature for the final mash rest/mash out? Would transferring the liquid *back* into the kettle waste time and cause a harmful temperature fluctuation? Or can the original mash temperature start out at the (higher) final temperature, and not worry about raising it? I have been using a trial edition of your software and I like it. I am having one problem, I am partial mashing and using a late addition of the extracts. I cannot figure out how to make the software handle this scenario. Since this is how I like to brew, I really should set up the software to accurately reflect (and hopefully calculate) my recipe parameters. Am I missing something, and if so, how should I set up my Beersmith program? You should be able to edit the extract – look for the “Late Extract Boil Time” when you edit the extract ingredient itself. 6-row malt has the highest amylase content so far as base malts go, so I ALWAYS add some because doing so helps insure more complete starch conversion of the remaining specialty grains…typically, 6 row will constitute about 25% of my total (partial mash) grain bill. Is the water pH critical like in all grain? Is a sparge necessary? Great explanation about partial mashing. Do you sparge when you partial mash? I’m not sure whether I should be wasting my time with an extra step or not if it’s not necessary because of the extract addition. The partial mash method uses about 1.5 qt of water per pound of grain. I understand that this concentrates the enzymes and the starches, promoting efficient conversion. The BIAB method, however, uses the full boil volume. Although partial mashers typically add extracts before or during the boil whereas BIABers “mash” the whole grain bill, it would seem that the goal of the mashing step would be the same: provide a concentrated enzyme/starch mixture at the appropriate temperature for sufficient time. Why do you use the full boil volume for BIAB and a fraction of that for partial mash?